Oh Deborah, congratulations! I am so excited for you, sweet friend. I will be praying this book touches many hearts and lives. I just purchased a copy and I look forward to reading it. You are such a blessing to so many...thank you for blessing my life. Love and hugs to you! Well, look at you. what an accomplishment!!! And, there are so many precious folks suffering from depression. I'm off to Amazon to add it to my cart. Have a great weekend! Congratulations dear Deborah. I just ordered your book and one called 'Grief Light ~ Reflections on Grief' by Julie Yarbrough. I look forward to reading both of these. May you do really well with this book and be inspired to write another. You have broken the ice now. Proud of you, Debbie. My copy is on its way. Lovely description on the back! Good luck with your book, Deborah. I also wrote a children's novel, I guess nearly 10 years ago, and it's for sale on Amazon. I did sell maybe 100 copies of it (as an ebook) in the first couple of years. I'm NO GOOD at marketing or selling myself either, so it has not progressed beyond that. But it's fun to say I wrote and published a book! The cover is lovely! I am so happy for you! Congratulations, Deborah, I hope your book does really well! Marketing is a hard thing to do. That is so exciting Deborah! Best of luck to you with your sales. I hope that you will continue to write and publish your blog and perhaps there will be another book in your future. Hooray for you, dearest Deborah!! I thrilled for you and so proud of your accomplishment. This subject is dear to your heart and certainly a passion of yours. May many people be touched and helped by your book. Wow, that is quite a milestone in your life dear friend! Had you already started writing this at the time we met? As for promoting it, try to use your labels and place them below your blogposts for search engines to find them. Also put the title of your book instead of amazon link. It has to be exactly and that will generate you searches and make it findable on Google or whatever. Yes, we little people have to do our own foot work and it takes a lot of time but in the end, this is so rewarding and like you said, it yielded special friends; you are one that I do treasure. Good luck and maybe you start a FB Page? I happened to see your name in the comment section of another blog and I thought - we have somehow lost touch! So I came by and I see that you have done something courageous and wonderful. I'm going to head over to Amazon. I remember before we lost touch, that you had had depression. I believe I opened up in your comments about my own walk down that path. I applaud you for living with this, through this, and making it a goal to share by writing a book, and perhaps help others. I hope you continue to blog, when we come to your blog we can see your story, although you may not reach as many people as you might with a published book, helping just one person is commendable. Me again :) I just went to Amazon to look for your book. When I typed the title in, searching under "books," it was not even listed on the first page of suggestions! :( I had to type in the book's name plus your name, to find it. So having a direct link from here will make it easier for people. I have never been in a depressed state until my husband passed away last summer. A tiny white pill my doctor gave me is helping me put one foot in front of the other. Beautiful! What an endeavor and one to applaud. 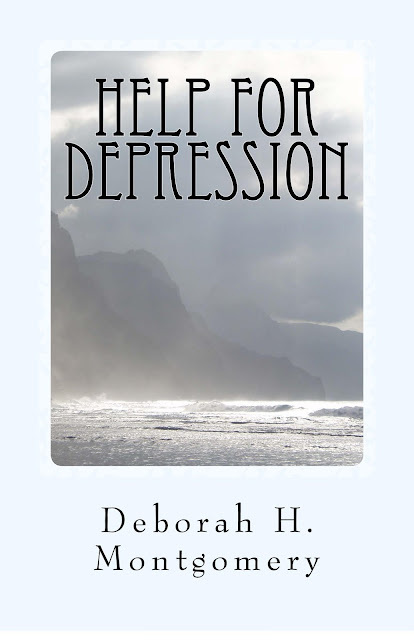 Congratulations on the book publication, Deborah! Wishing you much success on your book sales! Congratulations to you, Deborah! It takes courage to put yourself out there and I admire and appreciate your transparency. I will be over to Amazon directly to purchase it. I really love the simplicity of the cover and title and hope your book does well! When I read your post, dear Deborah,I felt a little teary eyed for many reasons; such an accomplishment~believing that your book will encourage and inspire others who walk this path~hearing of your own struggle, yet willing to write about it and offer help for others~making time to do what your heart desired to achieve. Congratulations!! You have chosen a beautiful cover and name for your book and I wish for you every success. My husband ordered a copy for my library and I look forward to reading it as well as looking upon it on the book shelf, knowing it was written by a dear, dear friend who I've come to greatly love. Deborah, I'm so proud of you! The cover is beautiful and I know from reading your blog posts that the message is bound to be helpful. I just put a copy in my basket and will finalize it tonight. I've never written a review on Amazon before but will figure out how to do that after I read your book. I think a couple of commenters here have offered good advice on getting your book the attention it deserves. Keep on writing! Deborah - you are amazing. I shall get my copy as soon as I replace my lost bank card. Such an important topic. Sometimes we just do those projects He puts in our hearts by jumping in the deep end and learning to swim as we go. I'm so proud of you and I know your book will be an encouragement to many people. I will be ordering a copy and will be happy to do a review on your behalf. Just ordered your book! Looking forward to reading it!